On this date in 1964, Western Australia conducted its last hanging — that of Eric Edgar Cooke. Cooke was one of Australia’s worst serial killers, and also one of its strangest: the eight homicides were almost unpatterned save for their rage. 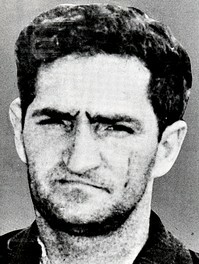 A harelipped, bullied youth turned delinquent turned small-time criminal — he had numerous arrests to his name for theft, for vandalism, for torching a church that rejected his choir audition, for auto theft and for being a peeping tom — Cooke busted out of obscurity and into nightmares on the night of Australia Day 1963 when he gunned down five random people in Perth‘s comfortable suburbs. But even by then he had already been stabbing and shooting at people, and menacing them with cars. Cooke’s Australia Day spree comprised four distinct incidents united to one another and to Cooke’s previous patterns by little but a lust for the hunt: his sole methodology was opportunism. Cooke shot a couple parked in a car (they survived), then an accountant through his apartment window (not so lucky); then, Cooke murdered a young man asleep on an open veranda, and rang the doorbell of another house to lure a fifth victim (both of these men also died). As he’d been previously arrested on the strength of his fingerprints, Cooke had taken the precaution to wear gloves, leaving police a very cold trail indeed. The shock of the one night’s carnage multiplied as weeks, and then months, elapsed with no arrest. Thirty thousand men were fingerprinted in a futile fishing expedition. [t]he small city … [that] had ways of a friendly, easy going big country town where people left their doors unlocked and their car keys in the ignition of open cars. They trusted each other. He turned it into a city of suspicion and terror. For the first time people started locking the doors of their homes and cars, stopped going out at night and slept with guns or any weapons they could find under their pillows. There’s a kernel of truth in this cliche, for Cooke liberally exploited Perthians’ inattention to security. When finally arrested in August of 1963 after he shot an 18-year-old babysitter, his confession explained that thanks to car owners’ habit of just leaving the keys in the ignition, he had frequently stolen vehicles parked for the night, used them in hit-and-runs or other crimes, and returned them before morning … the owners very often none the wiser. Cooke had, meanwhile, also strangled a social worker in the Perth suburbs in February 1963, and stabbed to death a South Perth beautician during a home invasion robbery back in 1959. He proved to have a photographic memory of his misdeeds, and could detail exactly the objects he had stolen in hundreds of long-past burglaries. He copped in all to eight murders and 14 attempted murders. With such evidence from Cooke’s own mouth his barristers had little choice but to pursue an insanity defense. This didn’t fly with the courts, but neither too did Cooke’s more embarrassing admissions to two murders for which two other men were already imprisoned. (Officially, the crown only credited him with six of his eight kills.) A “villainous unscrupulous liar” he was called for those claims; Darryl Beamish and John Button each served many more years in prison for these two disputed murders; with Blackburn’s help, they were both formally vindicated in the 2000s.